This 1911 FX45 is the G.I. model with all steel parts and solid mahogany grips. The FX45 GI is compatible with many different brands of 1911 magazines and parts as well. Reviews were very favorable and the price was simply too good to pass up! I have the ATi .45 in the full size. My son shot it, love it so much he wanted one! Good price and I have viewed positive reviews. Interested in giving it a try. Price,I like 45s,size plus I am a previous owner. Excellent value and positive reviews. I watch a lot of youTube videos and I like to compare prices and what users say about the firearms. This one was rated as very functional for the money you pay as 1911's usually demand a really high price. Price beat all others I could find, reviews were positive. Hickcock .45 ran 1000 rds thru his ATI with hardly a blimp....good enough for me. I watched Hickok 45, and he ran at least a thousand rounds thru his. It was consistent and after shaving down the front sight it was accurate. For this price I had to have one. If I like it as much as I think I will, I may order another. I've had this same gun once before and it fit very comfortably in my hand. Shoots and fires good, with overall good performance. It's a decent gun at this price. Im highly considering this GI 45. Can anyone tell me where it is made? BEST ANSWER: It is made in the Philippines. There are at least 2 manufacturers of 1911's there. They have been making the 1911 for many years, and they do a good job. And to you Ted, thanks for the info. You and the others helped me make up my mind! Cant wait to get it! I believe in the Philippines, I have one, excellent gun especially for the price, hope that helped. I believe they are made in the Philippines. I love mine and it works and is very accurate. Parts are manufactured in the Philippines but the gun is assembled in the US. My understanding is that it is manufactured in the Philippines. Philippines. I have one, it’s a solid entry level commander. It is made in the Philipines (sp) It is well made though. is this cast or forged frame and slide? That is a good question and one that you should direct to ATI to get a definitive no BS answer. It is both. The frame is cast while the slide is forged. my understanding is all ATI 1911 45 frames are forged. Forged tis weapon is awesome fo theprice. I own two. Well made and well worth the price. Ordered this gun by mistake , but a great purchase. Put one full box through it so far. Has not had a single issue. I bought this gun a year ago and decided to put it through some range time before I reviewed it. I have a little over 500 rounds through it (started to rain on my last range day). So far everything works fine . I had two fte's on the first mag but none since. I'm not crazy about the sights but they are servicable and can be changed. For the price your paying it's a great 1911. I have 3 1911's and I bought this for a reliable truck gun. Shoots great, and accurate after initial cleaning. Great purchase! Great gun. Shoots great. No jamming issues. I want another one! Upon initial opening the package of the firearm, it appeared to be slightly dusty. This is easily resolved by stripping the firearm, removing the grips and polishing with a wire brush and a small amount of gun oil, to bring out the lustrous finish associated with a more expensive gun. The battle sights are accurate and the firearm is easily controlled. Overall an excellent example of the Colt/Remington 1911 as by the US military forces. An excellent start for any collection. I'm surprised by the quality ATI put into their 1911's the slide and frame fit is perfect, better then some higher dollar 1911's I've shot. This gun feeds all types of ball no problem steel and brass. So far I have not found a HP ammo that it will feed reliably but this is to be expected as 1911's weren't designed to shoot HP. The finish is nice and the grips have a good feel. Even though this is .25 shorter then an original 1911 it has great balance and the trigger is nice and crisp. Right out of the box with some cheap factory ammo it's grouped very well 7 of 8 touching at 10yrds. I'm pleased with the pistol and i'm sure you would be to. This is an excellent 1911 for the money and it arrived sooner than expected. Accurate out of the box and so far it has been extremely reliable. Super gun! I am an experienced gun owner as well, just in case you thought this was my first😁. I have ran 200 rds through it, 100 Winchester white box and 100 Federal red box. Runs flawless, cycles smooth, no failures. It does shoot a little low if you line the sights up flat. If you make a triangle shape it's dead on. Front sight could be filed 1/2 way down to make sight alignment perfectly level. Mine came with an 8rd mag too, just FYI. I was skeptical. But I can tell you it’s amazing for the price. It’s not a Springfield. But it sure shoots nice. Well built. No play in the parts. Eats anything I feed it. After a few hundred rounds not one jam or misfire. Highly recommend. Gun, Price, and Dealer All Great !!! You won't find a lower price for this gun anywhere. I can tell you first hand, this gun shoots very well with it's 4.25" barrel. It's built solid too. An almost perfect 2 lbs empty. Grab a Gun was super quick to ship this out and I have no issues with them and I'll say they really have a great website and prices. You can't go wrong with this .45 caliber hand gun at this price !!! I bought this gun about a month ago, since i have put about 500 rds through it. No issues, no jams, no failure to feed or fire. Slide was a bit stiff out of the box, after about 50 rds it loosened up and racked beautifully. Trigger is much better than I expected, little take up and a super clean break. Fed this thing all kinds of ammo without any issues. Fit and finish was also much better than I expected, grips are actually wood and look great. All things said, Extremely happy with the purchase. I bought the same in the Govt. model and I also picked up the 9mm in the Commander model. Can’t beat them. Workhorse! Over 500 rounds since I bought it. No issues at all. Great firearm. Shoots a touch low but that can be remedied with a file and rebluing. If you want an inexpensive .45 in 1911, get this one. For the money it’s hard to beat. About 100 rounds down range with no failures. Its very accurate and again when you consider the price it’s a great purchase. Only one negative thus far and the reason I gave it four stars. You can count on at least one casing hitting you in the head out of every mag. Shipping to my FFL was fast. Fit and finish on the pistol are better than I expected. Accuracy is not up to 1911 standards, but break-in might help. For a carry piece, it will do just fine. For extra mags, go with Wilson or Sig. I love the way this pistol handles. For the price.. this firearm is outstanding. I’ve had it out 4 times since I’ve purchased and it runs through the cheap stuff with no issue... needless to say it runs through the higher end ammo great as well. Feels great in my hand. 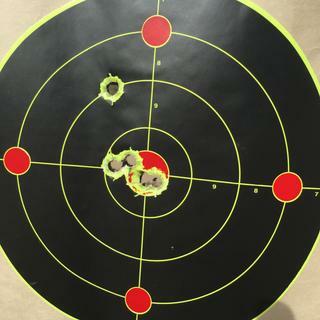 Sights were off center at 20yds but groupings were tight. Guys if you're thinking about buying this gun but you're unsure, DONT BE! This gun runs like a champ! No jams, no fte, ftl, nothin.. The only con I can see is the sights aim a little low. It's easy enough to correct, and either way you get a great gun, that looks great for the great price. Can't lose on this one! Changed out the origional grips for these sweet packymer grips. 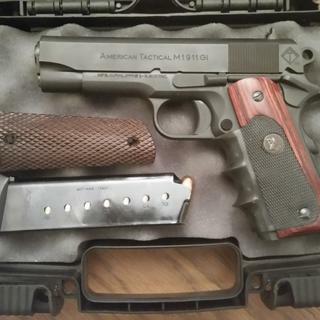 Great price on this ATI 1911 it fires great and I have some aftermarket magazines at fitted real well also comes apart easy and cleans very nicely. This is my 3rd purchase from grab a gun and each one has been fantastic. This pistol is the second one i have owned,and i liked them both,however, this one shots six inches low at ten yards. I have adjustable rear sight on it now, and that should solve the problem. It is a better built pistol than the Colts i have owned! shoots his. Fast service from Grab a gun. Would recommend. In fact my son in law bought this gun and sold his Kimber. 100% satisfied with both Grab a Gan and my new pistol. Like several have said, I wish that I could have purchased two of these. A great value for a 1911 clone. I have had a chance to test it out and I can report that mine has been completely reliable. I was not sure that I would like a 1911 and I didn’t really want to spend a lot of money on something that I didn’t want. This was perfect for me, and I’ve found that I do like the platform. Grabagun is an excellent website, this gun is great! I love the price and the quality of this firearm. I was a little nervous after ordering this online through grabagun, it was only my second big internet purchase. I got this gun 3 days after I ordered it though. Couldn't ask for better customer service, or a better deal, thank you very much grabagun stay classy! First things first, I ordered this pistol on the afternoon of 4-10-18, it was at my FFL on the afternoon of 4-11-18. *That* is FAST!!! shipping. The gun was well protected by a moderate coating of oil; a quick wipe and punch and it was ready for the range. The fit and finish was better than expected. Is it a Wilson? Of course not, but it is a well put together piece. With the one magazine shipped with the gun and three Pro-Mags (all I could find), I was off to the range. All four mags fed White Box ball perfectly. The only bobble was an FTF with an HP when I only had two in the mag. Other than that one, this 1911 ate everything I fed it and spit out the cases without fail. The front sight is going to have to have some neon paint or glow-in-the-dark nail polish applied. The holes appear where the muzzle is pointed, but the front sight is difficult to see in bright daylight and impossible to see in low-light conditions. Other than the sights (which were fully disclosed in the description as GI sights), this pistol gets five stars across the board. Easy to shoot, easy to carry/conceal, easy on the eyes and very easy on the wallet. This might just be the best handgun value on the market today. Very nice 1911. Everything fit great, no wobbling anywhere. All the standard test to check for fit was done and found it was perfect. This is a great 1911. If your looking for a cheap dependable worker, this is absolutely it! 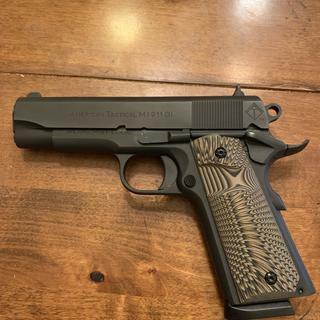 Though not a fan of the Commander model of the 1911 design I picked one of ATI FX45's up due to the $329 price...I bought my first 1911, a Colt Combat Commander, in 1980 and it cost more than this ATI. The FX45 that I received is a nicely made but basic 1911 that unlike my first Colt, actually works. I have added florescent orange paint to the rudimentary front sight, an ambi safety, and RPM magazine to improve the usability of the ATI and the handgun has ran 100% reliability throughout it's break-in period. Accuracy has been only fair with 7-shot groups at 15 yards of 4" or so with S&B, AE, and WWB ball ammunition. The action is rough and the trigger is of GI quality, exactly what I expected. Overall I am satisfied with the FX45 and would certainly spend the $329 again. GAG processing was slow as usual.If you are considering the FX45 you can have confidence that you will receive a serviceable 1911. The only thing I would change would be to offer the standard 5" Government Model and include an ambi safety as standard. The ATI FX.45 1911 will put a smile on your face!!! First of great service at the Grab A Gun counter in Flower Mound, TX. Got exactly what I wanted, fast and easy processing. This 1911 is very different from my Kimber micro 9mm, which I love to carry and shoot, it's top quality and down right beautiful to look at. I call it my "Gentleman's Gun" and will do the job if needed. Fits perfectly in my Gazelle 40 leather holster. Even we have it now in Texas, I'm not a fan of open carry. I like to keep what I have a secret.All this said, I must say, in stark contrast the ATI 45FX 1911 if much bigger heavier and not as "pretty" to look at but I could shoot the eye of a potato out with it. It is rugged and very handsome looking . . . even scary looking, and may be too much for me to carry since I about 5-9, 160. But I got me a perfect fit 1791 dark brown leather holster for it and together they do look like they men business on my belt.Now for the first range report with this baby, I am telling you I was amazed about the accuracy, more so than my Kimber micro. First 8 shots grouped the size of my fist at 22-23 ft. I smiled when I brought the target it and said WOW! Went on to shoot about 75 rounds, I wore the center of two targets out again groupings size of my fist. Had to zero in on other areas of the two targets and kept all my 8 magazine groupings to fist size or smaller. IMPRESSIVE and I'm not a pro shooter either. Can't say enough about this ATI 1911 (only $329 at GAG), simply huge value for the money. And it does what you want it to do which is the most important thing. You can spend a whole lot more on 1911's but why bother unless you just want brag about a brand. I can't wait to get back and get those groupings down to siver dollar size. Don't look any further for a 1911 or your wasting your time and money. Get one now form GAG and go to the range and smile a whole lot!!! First off great service with fast shipping from GAG, I have recommended them to others based on that alone, throw in their great prices and you just can't beat them. On to the handgun, for the price I'm very impressed with it. I made this purchase with the intent of using it as a project piece. When it arrived as others have noted it was heavily coated in oil, after cleaning it up I took it to the range and put 150 rounds through it with no feeding issues using 3 different factory loads, the only ejection issue for me was was a lot of the brass is ejected straight back into your face. For a fixed sight weapon this was nicely accurate right out of the box. I would definitely recommend this purchase, and for this price I'm considering getting another one. Great gun for the price. This was my first ATI gun, so was a little uneasy of quality. Took the 1911 to the range and ran 100 rounds through it, with no issues what so ever! The only issue I have now is minor, I bought some G2 RIP home defense ammo and that does not feed through the gun. Range brass ammo runs fine though!I would buy this gun again and recommend them(ATI) to my friends! For the money, great little commander. I did some mods to it. I lowered the ejector port and flared it as well. The slide to frame was good but a little rough. Cleaned everything up with Arkansas stones and the action was smooth as glass now. Finish is, well, okay. Had to refinish anyway to to lowering and flaring ejection port. Sights, shoot low. Not cost effective to have slide milled for Novaks, that will put you in a different cost category. Polished feed ramps, FPS, frame rails and slide. Put Wilson springs, a nighthawk match trigger and worked on the throat a little. Gun now shoots great and aside for POA/ POI, great little pistol. Did a two tone scheme and switched out grips that I had a laying around. Very happy with pistol. No FTE or FTFs. GAG again great and quick shipping to FFL. Ordered 2 like other reviewers said to do, really glad I did. GAG was spot on as usual with VERY fast shipping and a customer service department that is probably the best in the country. 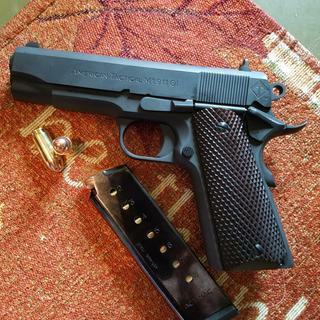 These are basic 1911's built well and can take a beating, don't be shy with them, have fun. They don't mind the cheap ammo either so load up and hit the range for a day FULL of fun. Got this gem yesterday and went to the mountains today and had a wonderful time. This is by far the best .45 for the money bar none. Been shooting .45's since 1972.....Army Military Police. I've got Kimbers; Colts; Springfields etc. and the fit of this one is as tight as any I've handled.........right out of the box deadly accurate. Had no malfunctions......spit out everything I feed it; and it was right on target. The trigger was a bit strong for what I'm used to; but a trigger job would take care of that. Thanks so much GRABAGUN !!!!!!! The ATI Firepower Xtreme .45ACP caliber 1911 pistol series is imported from Shooters Arms Manufacturing in the Philippines. 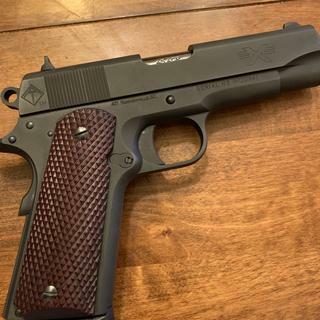 Available in different models, including classic military, GI, competition and bull barrel designs, the FX 1911 series features all steel parts, solid mahogany grips and a price point that won't break the bank. Compatible with many different brands of 1911 magazine, the FX series is certain to have the 1911 pistol enthusiast set for years of satisfactory shooting. First of great service at the Grab A Gun counter in Flower Mound, TX. Got exactly what I wanted, fast and easy processing. This 1911 is very different from my Kimber micro 9mm, which I love to carry and shoot, it's top quality and down right beautiful to look at. I call it my "Gentleman's Gun" and will do the job if needed.